I don't want to do this, but I simply cannot afford to deal with it, and it deserves better. Many of you will remember that this was one of my first custom re-builds and involved a "Book" Elite that was damaged in shipping. 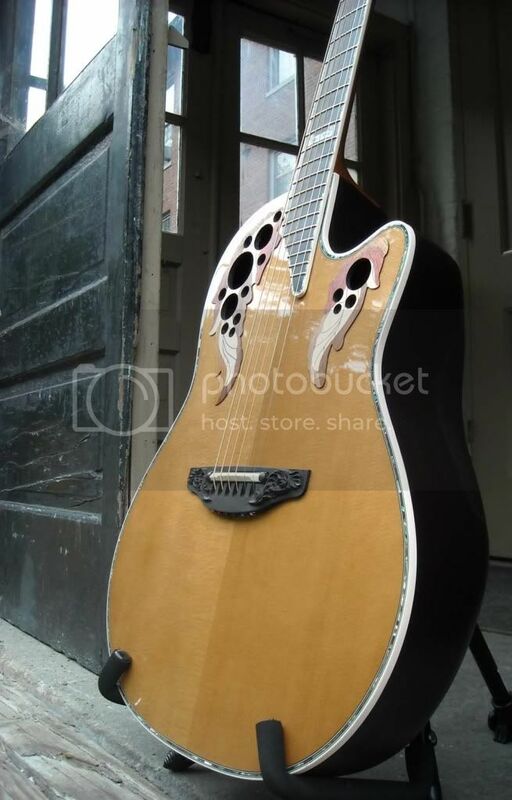 In 2009, the guitar needed a new top/bowl assembly and I had the factory customize it with a carved Ebony bridge and a glossed neck which makes all of that abalone trim on the headstock just jump out at you! 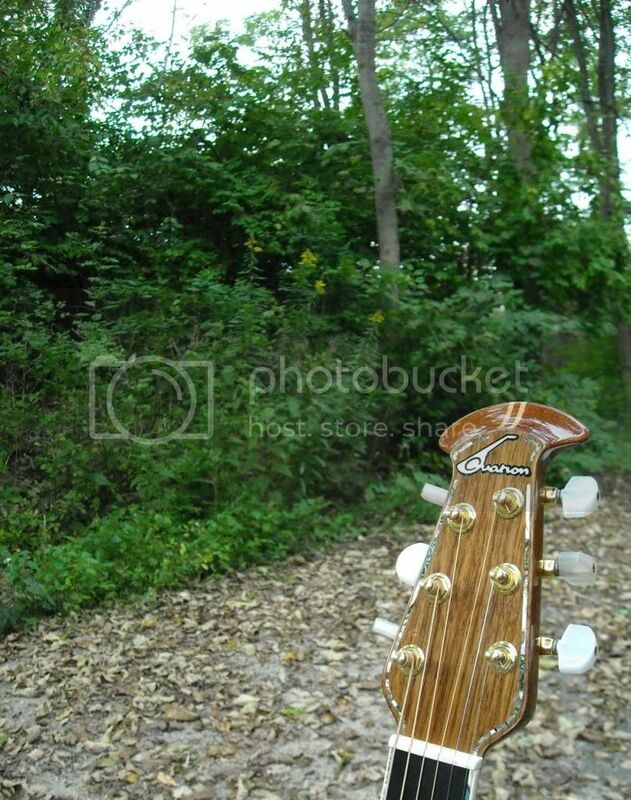 (This is my very favorite Ovation headstock!) And the sound was wonderful. I later learned that the original bridges were pinned to the top, but not so this one with its new bridge. I don't know if that was the difference or not, but it sounded stellar. So why sell/trade it? That's the bad news. I came into my office yesterday (Which is climate controlled and humidified.) and found a big ol' crack from the bridge to the pin. It looks to all the world like it dried out, although I don't know how. To be painfully honest, I simply cannot afford the repair, and it's too nice a guitar to put in a case forever, so let's try this. If this was still in perfect shape (Which it was a couple of days ago because I nearly took it down to play it, and it looked just fine. 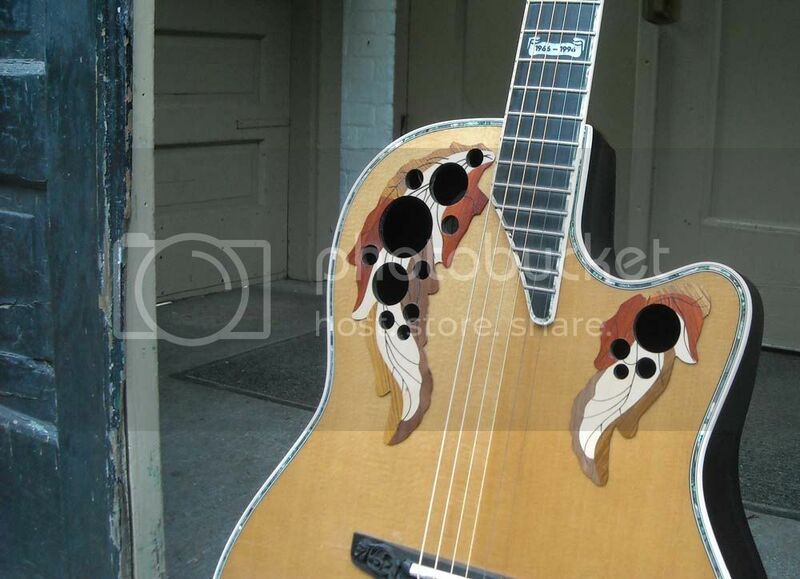 ), I would ask at least $2200 for it. So I will ask a low enough price for someone to get it fixed up and still come out ahead. But first, take a look. These are older pictures, except for the last one of course, but it looks exaclty the same. It has minimal fret wear and no other issues I know of. 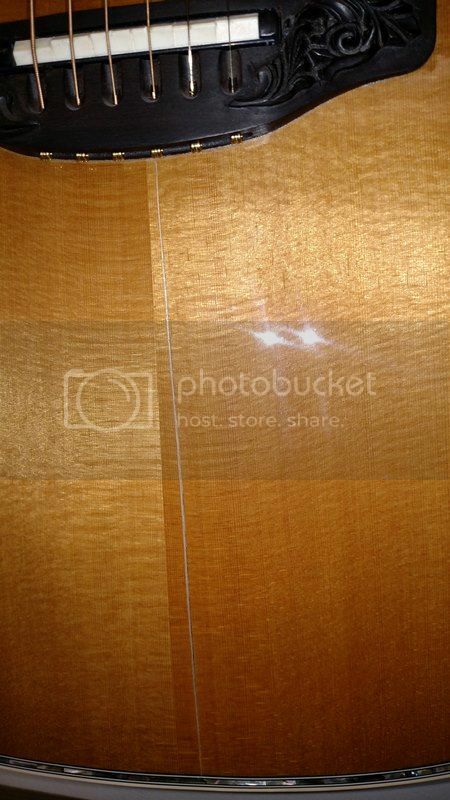 The last picture is the crack, and it speaks for itself, obviously going through the top. Terms, such as they are, will follow. If we are trading, we each pay our respective shipping. I am also willing to meet somewhere within a reasonable distance. So let me know what you all think. If it does not move, it goes into a case hoping I can fix it some time down the line, but it will be a long time. Location: Boise, Idaho I'm so sorry that this happened Patch, truly what a shame. I would love to give it a new home, but I just cannot right now because of finances. 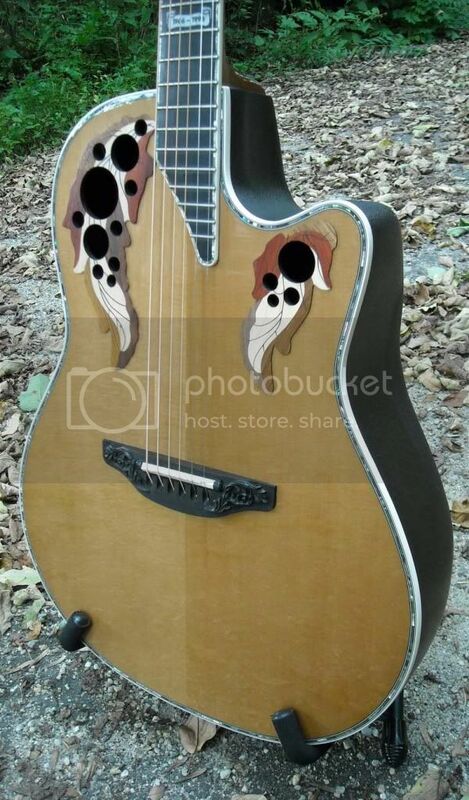 I hope who ever does get this one of a kind Ovation treats it with the amount of care you have. Location: What week? Shame on Mother Nature and her ways with fine woods. I feel bad for you, Patch. Very bad. Wishing you the best on finding a happy home for your wounded soldier. 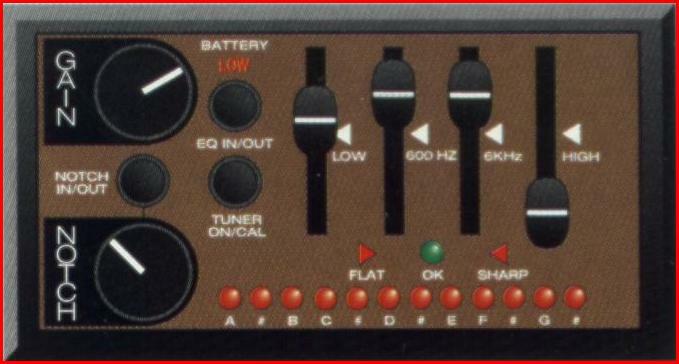 Location: California Patch- what preamp did you have installed on the guitar? Weird. I can't believe I don't have a picture of its pre-amp. It's the original Optima and works fine. I snitched this pic from Jerome. Location: Lake Forest, CA Sorry to see your Elite top cracked, Patch. I was thinking about putting a gloss finish on the Book Elite I bought from you. I really like how it looks, so I'll be glossing mine. Location: The Great Pacific Northwest Dang... wish I could jump on this one too. I would likely have them fill it as I bet it would blend in so nicely with the grain anyway, no one would know and I doubt you'd hear the difference. Good luck on the sale. I meant to update this thread a while ago. I had several good (and kind) offers, including one that made me think long and hard. But in the end, my wife decided for me and strongly "suggested" that I keep the guitar and get it repaired when I can. I don't know when that will be, but she rarely weighs in on my Ovation mania with anything other than a weary, and entirely audible, eye-roll. So now my "Book" is loosened up, cased up, and quarantined until the day comes when my budget is more forgiving of first-world, instrumental angst. Thanks everyone, and for the record, I love my wife dearly. She manages to be most understanding when I least expect it. Which is always very cool. Location: California Patch- in the end your guitar will be back the way you had initially the mother ship do for you. 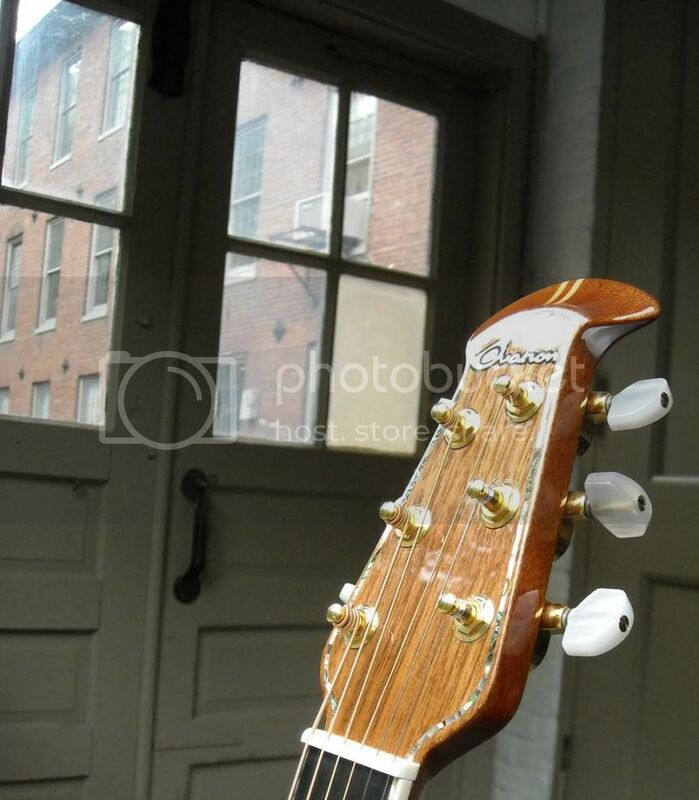 Keep us posted when is back from the factory, your guitar is really nice! Location: Boise, Idaho Two wise decisions, Patch. Location: Colorado Glad your wife is so supportive and insisted you keep it. Glad your wife is so supportive and insisted you keep it. Location: SoCal Patch, obviously, after all of the effort you made, frustrating but you have a couple of options besides replacing the top which, as you know is very expensive. (1)Drive over to the factory and most likely they will seal and match the crack. In the past guitars that went to the factory for other issues came back with a finish crack came back fixed at no charge. (2) Do the repair yourself knowing that it is not difficult to fix (see below) and will not affect any future repair by the factory. Usually the bridge will stop the crack from going further and playing the quitar should not create additional damage . From the photo, appears that it is a tight crack in the finish only. I agree with Mr. O that you may find it best to fix it yourself (at least until you have John check it out). One of my CL 12-str (cherry finish) has a similar tight crack. I used a water based glue and acrylic paint that matched the grain (mixed the paint on the top next to the crack to get the right match, then rubbed in the paint and glue into the crack - (any excess can be wiped off). Later, if you want the factory to do more, this should not affect any future repair. In my case, almost impossible to see or feel the crack. That was over seven years ago and no problem. You may find that you are the only one who is aware of your repair. Location: Always beautiful canyon country of Utah That Tony appears to be a most talented young gentleman!! Location: What week? Tony.. that sounds like a nifty fix. By a "water based" glue, do you mean like an Elmer's type school glue? And did you mix the glue and paint together at the same time you were doing the color matching, and then fill the crack with the mix.. or did you glue the crack first and then cover it with paint? Location: SoCal I am assuming that it is a tight crack. You can use CYA or school glue which dries clear (although I like Elmer's Glue-All which is water base). I do mix the glue and paint to mirror the finish...I mix the glue & paint on the top next to the crack as I then just wipe of the excess). I do not recommend CYA for a tight crack...Years ago, Kim spent hours training me how to correct finish cracks or cracks into the wood. From that, I wrote a FAQ for this board. Wider crack may require cleaning out the crack of old dirt or wax. Then, fill with either CYA or Glue-All. Kim said fill, then sand, then fill and sand (I use finishing pads from StewMac, high grit will not damage the finish). I have completely removed finish cracks, even on burst. HOWEVER, I would suggest discussing with John Budny for the newer thinner finishes. Couple of thoughts...make sure to humidify, also you could have a loose brace...good idea to check it. Location: SoCal By the way, for a tight crack, I use my thumb to pressure rub in the glue/paint into the crack. As I said before, a crack from the bottom up to the bridge will probably not go any further. This also applies to a crack from below the neck to the rosette. I do use StewMac #4 swirl remover and a foam pad. Years ago when I couldn't find a Hurricane, I bought an electric 12-string Wurlitzer (Italian made, double cutaway, burst) from a pawn shop...finish cracks into the wood on the back due to low humidity in Arizona. Light sanding with 800 grit, then matched the acrylic paint and glue and sealed. Took into Moz in San Diego for their advice...told that nothing else needed to be done. Location: What week? Tony.. thanks for the clarification. 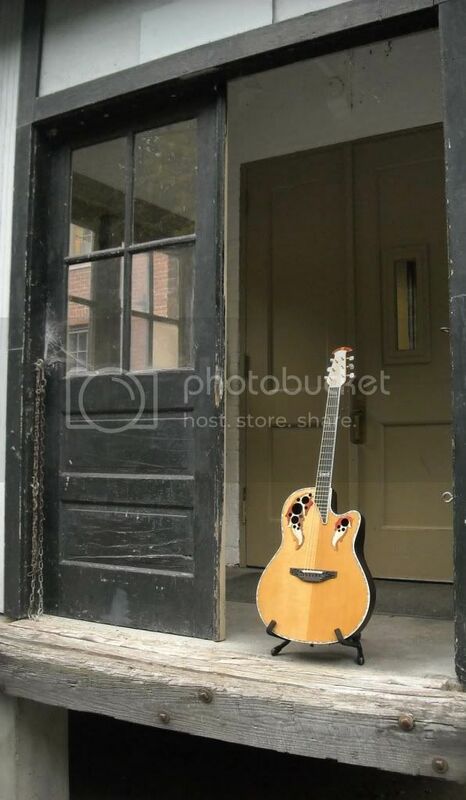 Now ya got me looking around the house for a non-guitar, cracked finish on something (wood furniture or whatever) to try it out! That's a cool idea Tony. But this crack is a true crack; goes clean through for its entire length. Someday, it will be good as new. It's gonna cost about a grand to get her there, but worth every penny. Location: GATLINBURG TENNESSEE :) I agree 100% with Tony on the repair. Of course, if you want it to be "perfect" (and I completely understand that, since you have so much time and interest in that instrument) you'll spend the moola down the road and have the factory do it. I wouldn't be surprised to find out they would give you an extremely great break on it though ... that's just the kind of thing they do... and that's why so many of us keep going back to have them do all our repairs and makeovers.